President Peggy welcomed all present to the FINEST Rotary Club in District 5130. The pledge was led by Bob Sorenson. Rich de Lambert then gave the invocation. Yale Abrams presided over visiting Rotarians. Today, Roger Olson from Healdsburg Club blessed us with an appearance. Good to see you, Roger! Alan Siedenfeld was a guest today of Keven Brown. President Peggy reported that Genie Delles, a longtime member of the club who is on a leave of absence while battling cancer has just finished chemotherapy and will soon have a bone marrow transplant. Our prayers and happy thoughts are with Genie and her spirits are high as she is in “warrior mode” battling her disease. 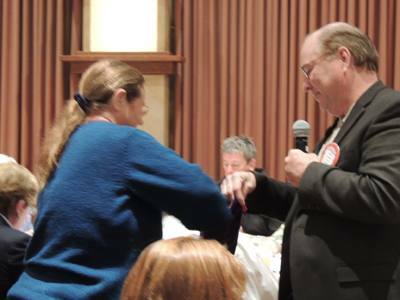 Bart Eddy hit the ground running as a new Rotarian by presiding over today’s raffle. Cathy Vicini was unable to win the $212 pot, but is rich in so many other ways -. family, friends, easy access to lots of great wine and a very charitable heart! May 17th – Petaluma Rotary Club’s “ Backroads Challenge” bike event. This is a trade out for their help in promoting Giro Bello. Please contact Doug Johnson or Don McMillan to volunteer. 5pm Friday April 15th. The Giro Bello Committee will be presenting a framed Giro Bello jersey to Lagunitas Brewery as a thank you for their generous beer donations at every GB event. We might lift a pint or two while we’re there! Feel free to join us. 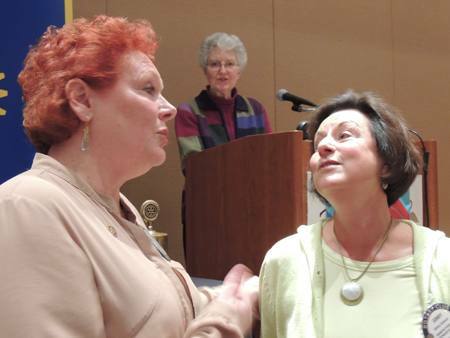 Elizabeth Karbousky showered gifts upon the Rotarians who were born in April. Those present who are celebrating April birthdays are: Gesine Franchetti, Debi Zaft and Ginny Cannon. Julia Parranto asked for our members to be sure and use their social media contacts to promote Giro Bello. Everyone who has a Facebook account should be using it to recruit riders and/or sponsors! Cathy Vicini asked for a show of hands for those who will be attending our evening social/fundraiser on April 23rd at the Flaming-O. She encouraged the membership to donate items for the live and silent auctions. There will also be surprise raffle prizes. $25 gets you in, folks. This event will take the place of our regular Wednesday noon meeting and family members are more than welcome to attend. Debi Zaft announced that May 2nd would be our next regular club social. She is looking for a winery in which to have this event. Wayne Rowlands shared that tomorrow night (Thursday, April 3rd) would be the next Rotary Means Business meeting. The meeting will take place at Stanley Steemer in Rohnert Park. This gal has been active in the club since she started with us last year. She helped with the monthly birthdays and then took charge after her co-chair had to drop out. She hasn’t missed a beat. 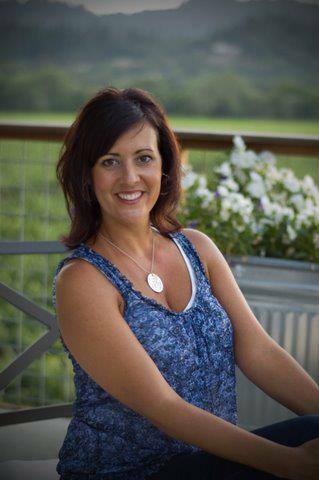 She is active in the World Community Service Committee and has committed to being a lead for a rest stop at Giro Bello. This young woman is a rising star in Rotary. 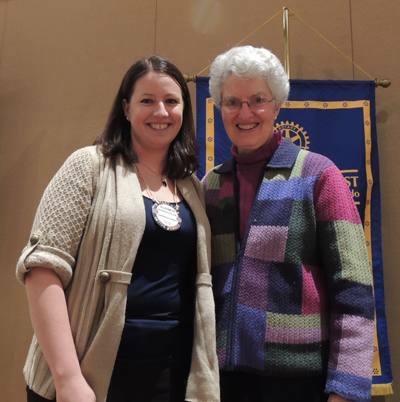 The Rotarian of the Month is Elizabeth Karbousky. President Peggy explained to newer members about paying “fines”, otherwise known innocently as “recognitions”. 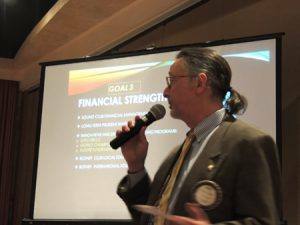 Rotarians have the choice of directing the fine money to the club (which will be deducted from your semi-annual club dues), or the local Club Foundation, Rotary Foundation, Paul Harris, Scholarships, Polio Plus, all of which are considered tax deductible contributions. These contributions do NOT qualify for credit against your semi-annual dues. Stephen Passalaqua, Cathy Vicini and Julia Parranto who had some sort of a three way admiration thing going that was too complicated for me to follow. Anyway money changed hands, backs were slapped and the club ended up with more cash to spend on good deeds. Diane Moresi celebrated the 5th year of life for her beautiful granddaughter Molly by donating $100 to Molly’s Paul Harris. Mike Kallhoff was recognized for $25 worth of TV stardom. More about that in an upcoming program! Bob Higgs paid $25 and said, “It’s for the kids”. Bob has been working with the Junior Achievement program for a number of years. Then the Happy Dollars started to flow! 10 bucks buys you a confession. Matt Everson jumped all over that (even trying unsuccessfully to get it down to 5 bucks) saying that he has the governor of a Brazilian state picking him up the airport on his upcoming trip. Way to work the Rotary networking, Matt! Elizabeth Karbousky took advantage of the happy bucks to announce she now has a new hybrid. (I think that’s a car). Don McMillan recognized his better half, Jackie for her tennis prowess that was on display for a couple days in the desert at Indian Wells. Ann Gospe celebrated the final chemo treatment for a friend with a $10 Happy Dollar donation. Rich de Lambert spent a week or so in Oregon and somehow was surprised that it was raining – IT’S OREGON, RICH! THAT’S WHAT IS IT DOES! PP Queen Jeanne proudly announced that her daughter Laura is singing in a production of Little Shop of Horrors at the Sonoma Community Center. To improve the quality of life in our community and throughout the world through service above self, collaboration and fellowship, strong commitment to high ethical personal and professional standards, and promotion of goodwill, understanding and peace throughout Rotary International. To become a premier Rotary Club within District 5130 by demonstrating effectiveness in all areas of service, attracting and retaining diverse membership, actively pursuing collaboration and innovation to achieve excellent results, and promoting the well-being and leadership potential for our youth. Goal 1: Promote, attract, and retain a highly diverse club membership with a strong commitment to service above self and high ethical standards. • Recognition of public safety services and contributions to our community. Goal 2: Through our Five Areas of Service and Service Above Self, Promote and advance the well-being of the youth, elder, and people in need, as well as investing in the leadership development of our community’s youth. Goal 3: Achieve and sustain financial stability through sound club management, innovative and effective fund-raising programs, and long-term prudent investments. Remembrance: Teri Shaunessey, club member 2005-07 died of cancer on March 19th.